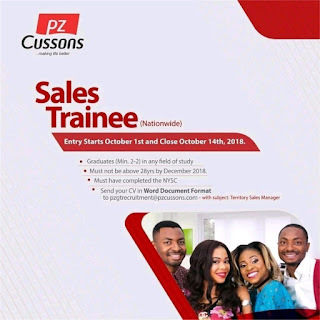 Apply for the PZ Cussons Nigeria Plc Graduate Trainee Scheme for Nigerian Graduates, Send CV in Word Document Format to pzgtrecruitment@pzcussons.com. The PZ Cussons Nigeria Plc Graduate Trainee Scheme seeks to provide a thorough induction into various aspects of our business, equipping our prospective employees with the requisite skills needed to advance their career and development. Over the course of several months, successful candidates will be provided with the required professional, analytical and social skills to assume a position in the organization. Do you know innovative and result-oriented graduates willing to join us? We are inviting CVs of qualified candidates ONLY. Not more than 28 years by December 2018. Send CV in Word Document Format to pzgtrecruitment@pzcussons.com with the subject: Territory Sales Manager.